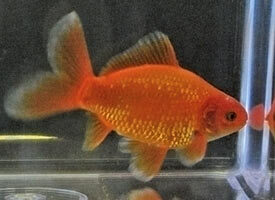 From time to time, 'sports' are observed amongst young fish that, although departing from the standards of the particular variety being bred, are sufficiently striking to merit development as potential new varieties of goldfish. 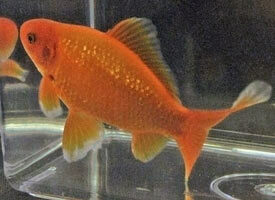 As described under Other Varieties, the Chinese recognize some 300 varieties of fancy goldfish compared with the 25 or so varieties bred for the show bench by British and Western hobbyists. 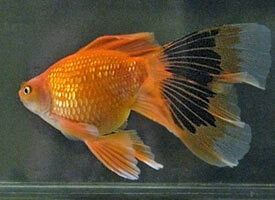 Further, British and American breeders sometimes deliberately set out to create new varieties by cross-breeding different goldfish types, with a particular image in mind of the intended new variety. 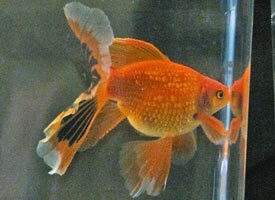 We present here some of these experimental varieties of goldfish. In appearance, imperials are mid way between a red metallic Bristol shubunkin (which is a type that does not actually exist) and a singe-tailed red metallic veiltail (which, again, is a type that does not actually exist in its own right). The colour type is unusual in that the edges of the scales are matt whereas the centres of the scales are reflective, giving an opalescent appearance, sometimes with matt bands along the centre of the body. Imperials are being developed by members of the GSGB. 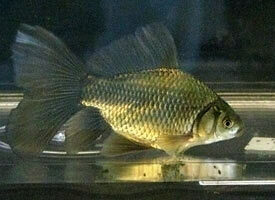 Notice the shorter, deeper body compared with mainstream single tailed varieties and the large tail reminiscent of the Bristol shubunkin but without the vertical carriage of the tail. 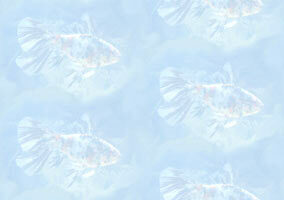 Notice also the opalescent scales, particularly in the lower fish. 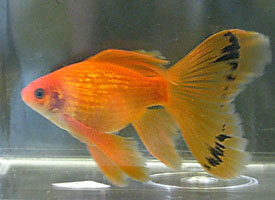 The black colour in the tail is a remnant of the juvenile colouration and should fade to red as the fish mature. These fish were photographed at GSGB 2009. Young adult imperials with a longer body and smaller, shorter finnage, with a distinct matt band running along the centre of the body. Photographed at GSGB 2009. 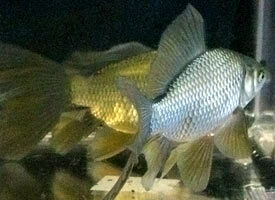 These young fish, bred in 2009, are of the larger-finned type at the top of this section. They possess juvenile colouration and are expected to mature into self-coloured red adults. Photographed at GSGB 2009.